On picking up our Spring 2005 copy of RSPB Birds magazine and reading a member’s letter, I was sent scrambling for my birding diaries. 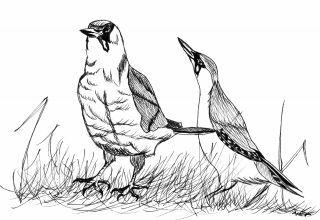 The reader had reported an encounter with two male Green Woodpeckers engaged in combat over territorial rites. The synchronized movements of the dueling birds are rarely witnessed, but Christine and I have been privileged to see it for ourselves and here are my diary notes on the observation. During the morning of Easter Monday, 16th April 2001, we were treated to one of Nature’s rare spectacles. What at first appeared to be an amorous pair of Green Woodpeckers engaged in a courtship ritual on the footpath in front of our Ashton-under-Hill bungalow, were in fact two males. This dance which is apparently unique to the species, involving two mature males face to face, on this occasion on the ground rhythmically swaying their heads from side to side, wings spread and tail fanned. Probably the most graceful fight you are ever likely to encounter anywhere. The threat display incorporated bouts of gentle bill-fencing and finally a flapping squabble before dispersing to separate trees. According to Birds magazine the display is usually seen in June or October but if the squabble is over feeding or roosting and potential nest sites I cannot see why particular months should be of note. Mr Shaw from Suffolk made his observation in October, which perhaps eliminates defense of good nesting territory. Reader’s Digest Birds of Britain claims the display is between males fighting over a female but there was no female present whilst we watched. However, our front path was always alive with ants that nested under the paving slabs and so I believe the dance of the males in this instance was associated with defending a food source from being invaded.